Jimmie Ollie, 40, of the 1400 block of West 71st Street, was charged with first-degree murder. 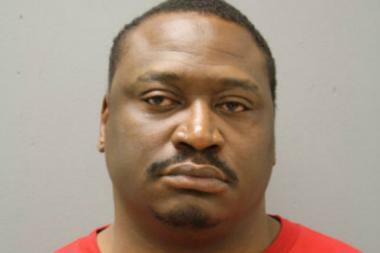 CHICAGO — Jimmie Ollie and Scottie Cartledge were colleagues, both members of the Conservative Vice Lords street gang, but that didn't stop Ollie from gunning down Cartledge at a party last month, prosecutors said Sunday. Prosecutors said Cartledge, 36, and Ollie, 40, of the 1400 block of West 71st Street, were attending a party in Englewood on May 29. Cartledge was angry Ollie appeared at the party with an individual Cartledge believed was responsible for murdering his brother. The pair argued until Ollie angrily left and walked to a parked car, returning with a gun and shooting Cartledge in the chest, Assistant State's Attorney Bridget O'Brien said. Cartledge, of the 6300 block of South Fairfield Avenue, was shot multiple times and pronounced dead on the scene, police said. Ollie shot Cartledge seven times, according to court documents. Ollie fled the scene, but was identified by witnesses from the party, police documents said. He was taken into custody Friday after being arrested on a warrant in Round Lake. Prosecutors said Ollie admitted to the murder before his arrest. Ollie was charged with first-degree murder and ordered held without bond Sunday after appearing in bond court.